We spend a good amount of our season traveling to different parts of Oregon. I was so excited to get to head down to Bend to help Anna and Alan with their beautiful golf club wedding last July! 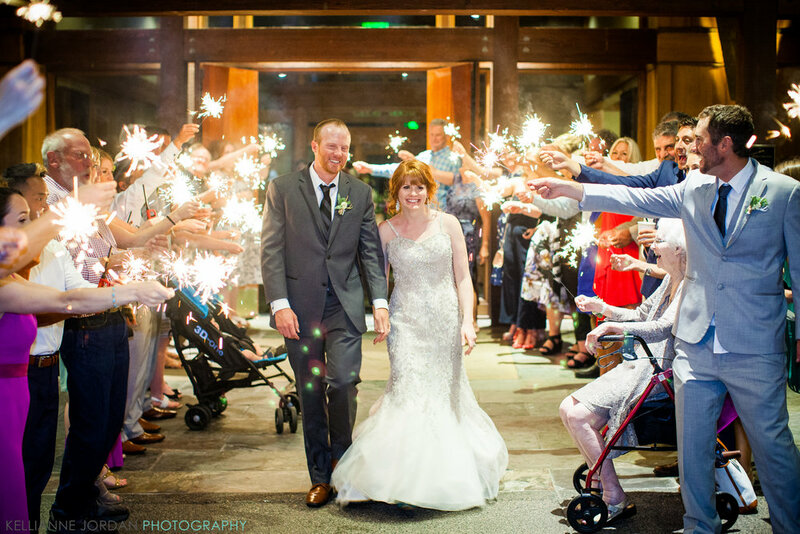 After a traditional catholic ceremony at the new St.Francis church, the couple chose the gorgeous Broken Top Golf Club to host their wedding reception. While the two met living in Wyoming, they chose to come back to Anna’s home state to tie the knot. Guests arrived to the golf club and were greeted with handmade photo collages from the couple. Once inside, they were able to imbibe in some local beer and wine while overlooking the fabulous greens of the golf course. Kelly Anne Photography finished up with the bridal party shots, and once everyone was back inside, it was time for a delicious meal prepared by the golf club. Bend Event Sound was on hand to assist with toasts as well as set the musical tone for the evening. After a beautiful series of speeches, everyone got to indulge in a mouthwatering piece of cake from Dreamin' Desserts. The rest of the night was for drinking, dancing and, if you were so inclined, a keepsake photo from Adventure Box Photo Booth. Anna and Alan, your wedding was such a joy to be a part of!! Thank you for having me there to celebrate with you!